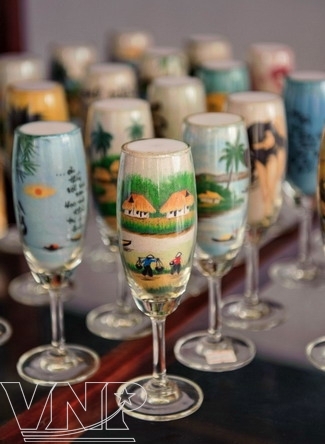 Everyone who visits the sand painting workshop in Phan Thiet City, Binh Thuan Province, are surely surprised by an enchanting world of sand paintings on different themes of nature, animals, portraits and landscapes. There are also some tiny artistic works, only about 5-10mm, with two sides being two images. Visiting the workshop’s showroom, people are mostly impressed by the collection of artistic works that depict the portrait, life and career of Uncle Ho. Most notably is the work entitled “Uncle Ho Works at the Presidential Palace” created on the occasion of the 118th birthday anniversary of Ho Chi Minh. It is 1.2m long and 0.6m high and made from 20kg of sand with 30 different colours. The front side of the work is the image of Ho Chi Minh who was writing an article in the Presidential Palace and its backside is the landscape of sand dunes in the early morning dew in Mui Ne. The work took the artist over three months to create. Sand Painting Artist creates art from sand. 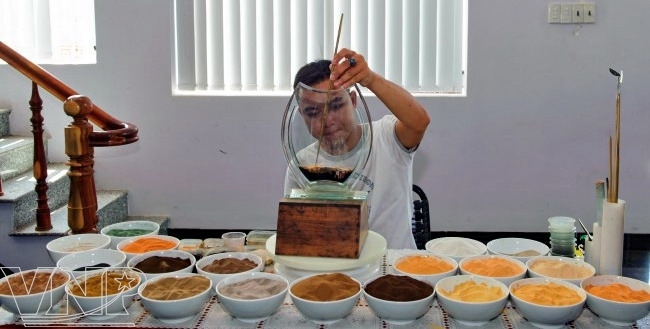 Instructing on making artistic works from sand. An artistic work is created according to the sample. Therefore, Sand paintings have implicitly become a symbol of cultural and artistic gifts, a rare and precious handicraft. The artists have created various kinds of sand paintings such as Landscapes, Calligraphy works, Logos, Particular architectures , Art forms, Religious themes. Especially, sand portrait are the most complicated and difficult art works to make because they require the exact alikeness between the portrait and the person portrayed, the liveliness of the portrait. 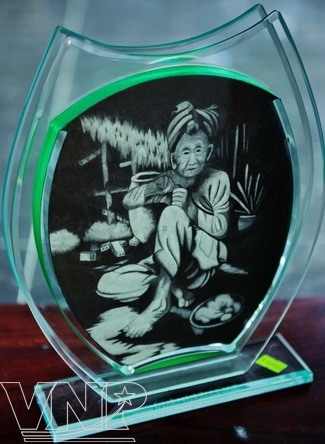 More and more local and foreign customers have placed orders for Phan Thiet sand paintings, esp. the portrait ones. 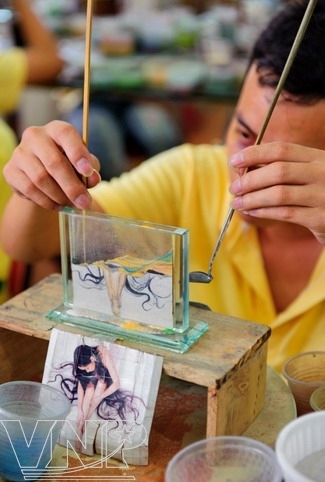 Making sand paintings requires an artist to be meticulous in details. “Sand Dunes in Mui Ne”. “An Elder in the countryside” . 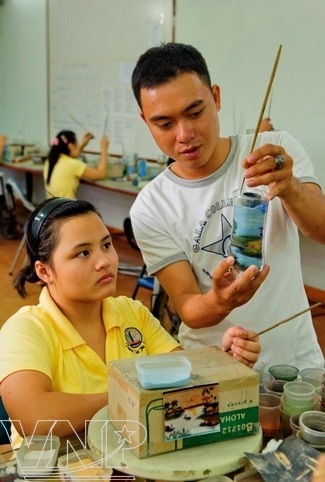 In 2009, the artworks of Sand Painting Workshop were displayed at Vietnam’s Handicraft Exhibition held in Malaysia in 2009 and drew much attention from foreign tourists who were very surprised when learning that these works were made by disabled Vietnamese. 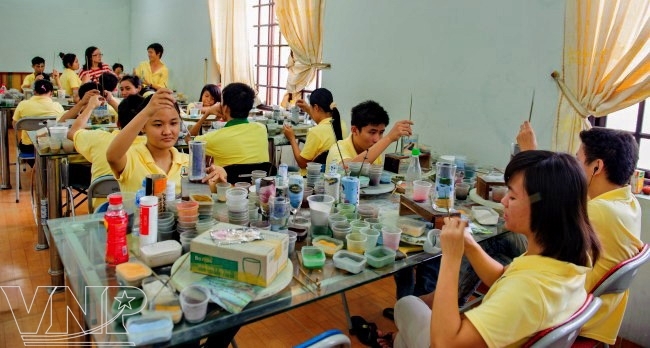 Visiting the workshop, tourists see talented disabled artists working diligently. 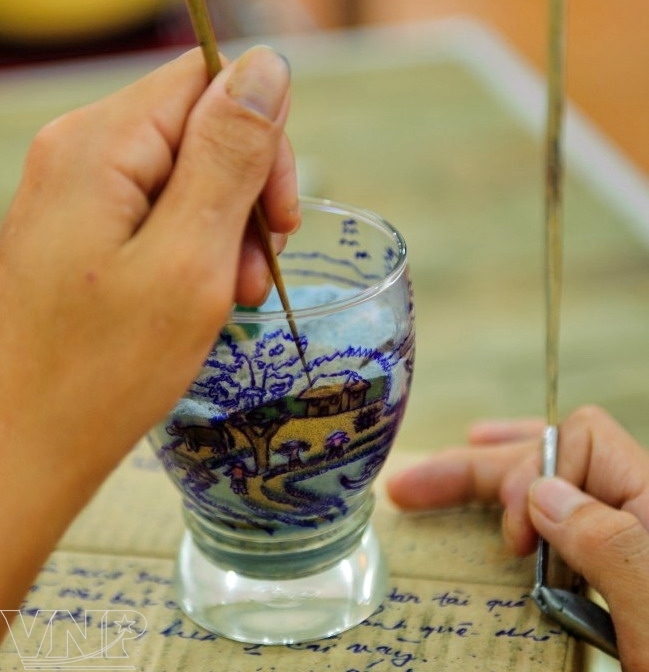 With their love, creativity, meticulousness and aesthetic sense to the art, the artists bow their soul to every grain of sand to create thousands of valuable artistic works, making a contribution to promoting the image of Vietnam to friends all over the world. Zone 1: Cambodia,Hongkong, India,Indonesia, Macao,Malaysia, Myanmar, Phillipine,Singapore, Taiwan, Thailand, Guang dong, Guuangxi ofChina. Zone 2: Japan, Laos,South Korea. Zone 3: Autralia, Bangladesh,Brunei, Newzealand,Pakistan, Sri Lanka. Zone 4: Therest of China. Zone 5: Croatia, Cyprus,Mexico, United Kingdom (UK),United States (USA). Zone 6: Caymand Islands, Canada,Denmark, Egypt, France,Geogia, Ireland,Luxembourg, Mauritus, Monaco. Zone 7: Kuwait, Isarel, Qatar, Saudi Arabia, UAE. Zone 8: Albania,Austria, Belarus, Belgium, Brazil, Bulgaria, Czech republic, Estonia, Finland,Germany, Greece, Hungary, Italy, Latvia, Netherland, Norway, Poland, Portugal,Romania, Russia, Spain, Swithzerland, Turkey, Ukraine. Zone 10: Angola,Barbadoss, Belize, Bermura, Bristish Virgin Islands, Chile, Colombia, CostaRica, Ecuador, Ghana, Guatemala, Jamaica, Nigeria, Panama, Paraguay, Peru,Uruguay, Venezuela. Zone 11: Angentina,Cote d’Voire (Ivory Coast), Libya, Senegal,South Africa. - 8% of International EMS rates. - FSC is applied and subject to change. - Remotearea surcharge will be applied to EMS item to remote areas at the destinationcoutries, please to visit remote area list for more information.Pls refer here. For further information you might need, please contact us directly.